Want to be notified of new releases in vsoch/repo2docker-conda? This is a continuous build template based on the python_conda_pip binder example, meaning that it shows how you can install Miniconda alongside Python (meaning Jupyter notebooks!) and then deploy a container automatically using Docker Hub. 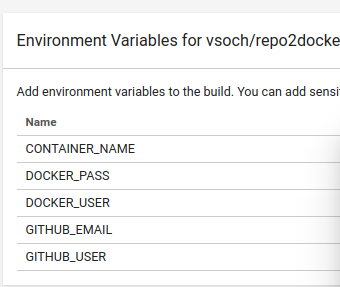 The presence of an environment.yml file will tell the repo2docker to build a container with a Miniconda installation! You can use this example as a template to create a complete build->test->deploy pipeline on CircleCI. If you intend to use pip, don't use a requirements.txt - add a - pip section in the environment.yml file. First, fork the repo2docker-conda Github repository to your account, and clone the branch. Once the environment variables are set up, you can push or issue a pull request to see circle build the workflow. Remember that you only need the .circleci/config.yml, .circleci/template.html and not any other files in the repository. If your notebook is hosted in the same repo, you might want to add these, along with your dependencies files.